Just 10 letters to go until we have a full alphabet - that's what this lesson will cover. We'll look at them in detail, and then there's a video of them being written. 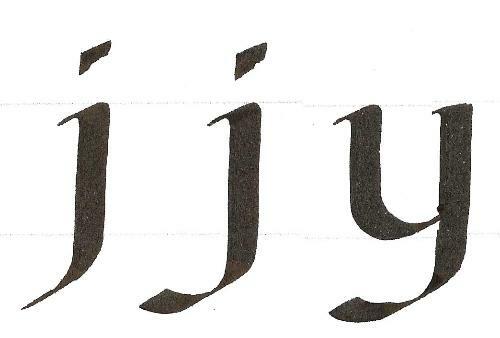 j starts like the i, but goes below the line, and you finish by moving your nib to the left (still at 30 degrees) and lifting, to give a neat end to the stroke. If you prefer a heavier tail (the 2nd example), you can add another stroke, left to right. y is just like u, adding the heavier tail. There's an alternate shape for y coming shortly, so you'll have choice! 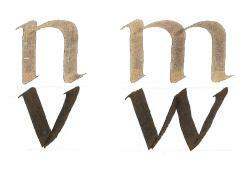 The first stroke of a is the same as the second stroke of n.
Then you make the bowl - keeping it tucked below the half way point of the letter. The more similarity of shape between the bowls of your e and a, the more consistent your writing will look. 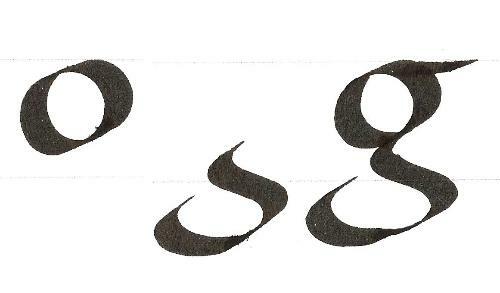 As we saw in the skeleton letters, g has some complexity, but it does make a beautiful letter! First construct a perfect o which is 3/4 of full size. Now make the tail stroke - think about flowing gently round those corners - no sharp points here. You may be able to do the tail in one stroke, but more likely that you'll need to do the final piece as a separate stroke. And don't forget the "ear" at the top of the letter, heading off horizontally. The s is made of 3 strokes, none of which are particularly curly - but come together to form a nice sinuous letter. Most books recommend that you put the middle stroke in first, then add the top and bottom strokes. This works fine, but a number of learners have found it easier to put the top and bottom stroke in, then join them together. Give them a try. Important to try them in words - they should look like they belong. When all the letters in a piece of calligraphy look like they belong together, it helps make it harmonious and beautiful. The remaining letters are k,v,w,x and z, plus I offer an alternative y. Each of these are made of diagonal strokes (have a look back at the pencil letters we did at the beginning). A good visual guide is that the k,v,x,y and z should be as wide as your n, and the w should be as wide as your m.
And notice that the second stroke of the k barely touches the downstroke. What you may also notice is that, as you construct them with your pen at 30 degrees, some of the letters look a little heavy, and the middle of the z looks a bit flimsy. So having resolutely stuck to 30 degrees, we're going to alter that a tiny bit for a few strokes. We're not doing it to make life hard - but because it makes these few letters look better. Try a slightly steeper pen angle (45 degrees) for all strokes of v, w and this diagonal y. Try a flatter pen angle (15 degrees) for the middle stroke of the z. It's easy to agonise over this - please don't! I'd suggest having a little play and seeing if these suggestions help - if they don't, ignore them for now. You'll also find you need plenty of care to make the letters look upright, and that the bottom of the letter doesn't look clumpy. But you've conquered 21 letters - the last 5 will not defeat you! Well.... 26 letters to play with - how exciting! If you google "alphabet sentence" or "pangram" you'll find all sorts of sentences (in English and other languages) that use all 26 letters of the alphabet. These are really handy for calligraphers - helps us practice all the letters, in real words. Here's a video of nearly all the letters - the A suffered a terrible chopping off accident! On a clean sheet of paper, rule some light pencil lines at 4 nib widths, and write jyags kvwxyz.